You where having issues with the power steering pump both Saturday and Sunday mornings - I guess we can say without a doubt that it was not just a temperamental pump that did not like cold fluid.. It was a great morning to be working on the toys - sunny and warm. If the parts come in this week, maybe this weekend? 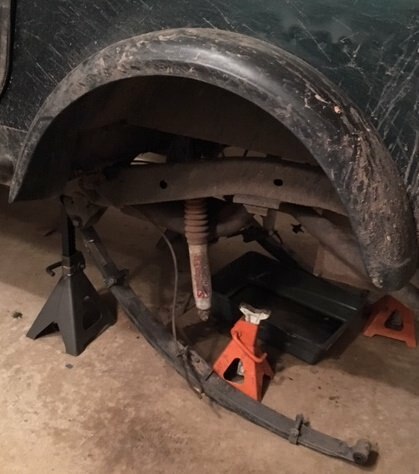 I'll toss the axle plus new parts in the back of the Yukon and come your way. I do not have a press ...yet. might be easier to head up your way. lets touch base thrusday. Damn, sorry you guys had issues. I hope the repairs are/were easy. What trails did you guys do on Sunday? Did you do Crawl Daddy? I'm glad everyone is safe and working through installing some parts and such! trail report for Sunday did not include Crawl Daddy. 4 old, very, very , very old TJ tires with no usable spare and a time frame to be "on the road" had us changing the plan to run soem easier trails. The easier trails were a good challenge too. The group of three OGs just drove thru the trails playing on the challenges as they came up. The trail like everything else had changed and became a bit more challenging for the time frame we had alloted. Black Jeep and VP, I think it is a bridge too far for your rigs without cable and danger of pinch weld damage. Open gearing would complicate the challenge and raise the risk of sheet metal damage. but after the next rain/snow melt who knows! it will be different again. CJ is in need of some heavy tools to install the new gears. Garner, I am checking on base at their hobby shop to see if we can do the rebuild there. Will get back with you today. All it has been a great to wheel with you all this year and look forward to fun on the trails next season. After doing a little math and talking with a shop I know & trust, I decided to just drop the rear end off, along with the parts I'd ordered, with them. They are going to work it in between jobs and knock it right for about 2/3 the price of good pinion depth setup tool. WE all fall into that catagory. Any time you all want to wrench at my place here in Alexandria I’m all for it. I’ve got a pretty big driveway behind the house here.